Avoid using shampoos that will strip your hair's natural oils and leave it dry. Shampoos that are formulated to cleanse thoroughly, but not strip Black hair and super curly hair types of all its natural oils, but replenish them, such as Kerasoft Enrich Shampoo are the only shampoos we recommend. Remember, you do not want your hair to be "squeaky clean" after shampooing if the hair has a very strong natural curl pattern. Any shampoo that leaves the hair in squeaky clean condition has not been properly formulated for Black hair and very curly hair types. Depending on the length of your hair, the chemicals you have in your hair, the natural texture of your hair and the condition it is in, you can manipulate your hair to varying degrees when you shampoo. We will describe two ends of the spectrum.If you have short, naturally straight hair, with no chemical processes done to it, then you can give your hair and scalp a good scrubbing and suffer little or no damage, or consequences. If you have long, relaxed and or coloured treated hair, then we ask that you treat your hair as you would a fine silk blouse. Do not scrub or rub your hair while shampooing. This is not necessary in order to achieve clean hair. You may damage the cuticles of your hair in the process. Gently massage the shampoo into and through your hair, working it into a lather on your scalp as you gently remove dirt and dead scalp cells. We recommend that you shampoo two to three times, rinsing well between shampoos. Condition your hair every time you shampoo. 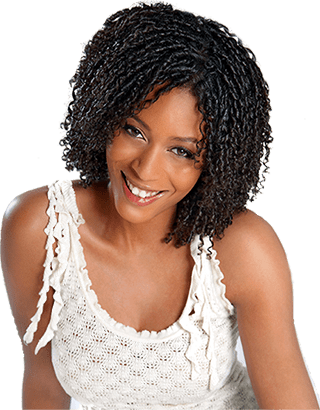 You may not always have time to do a deep condition but there are conditioners that rinse out after only a few minutes and others that can remain in after applying. Conditioning is one of the most important things you can do to upkeep your hair’s health and appearance. After shampooing your hair, press the water from your hair, first with your hands and then with a towel. Always avoid rubbing the hair at all times, as your hair is at its weakest condition when wet. Avoid brushing or over manipulating your hair when it is wet, doing this may lead to breakage. When hair is wet it swells and stretches which can result in breakage if handled roughly. Without getting too technical, if the shampoo starts with ingredients such as sodium lauryl sulfate, ammonium laurel sulfate, sodium myreth sulfate or any lauryl/laureth sulfate or similar sounding names. We recommend that you not purchase or use these shampoos. 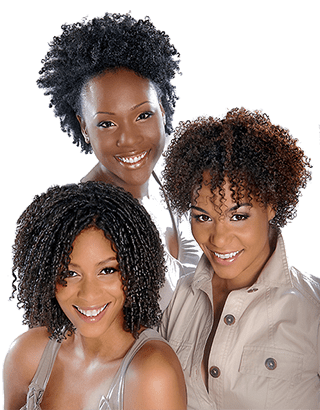 They are not truly designed for naturally curly or Black hair and we have found they tend to be much too drying and stripping, which is not good for hair with curl. As we all know, dry stripped hair equals frizzy, puffy hair. As a further note; people with curl in their hair do not want to use a shampoo that will make their hair "squeaky clean". As hair that squeaks after shampooing, denotes that the hair has been stripped to a state with no lubrication. This is why it squeaks. For people with straight hair this may be fine. A shampoo that is designed for hair with curl should be formulated with amphoteric surfactants - surfactant means; surface active agent, a fancy technical way of saying cleanser. Amphoterics are mild cleansing agents that are neutral in nature and gently cleanse the hair without stripping it. Some product manufacturers do add strong conditioning agents to their shampoos that contain the laurel sulfates as their active ingredients to compensate for the stripping action of these cleansers. However, this is not sufficient or good enough. Many do this to save money as there are higher costs involved in manufacturing with amphoterics. (* There is an exception to this guideline, this being sodium trideceth sulfate, it acts synergistically with amphoterics when added with them to a shampoo as a secondary cleansing ingredient). For example our Kerasoft Enrich Conditioning Shampoo costs our company 2 -3 times more to manufacture than a company using sulfates in their shampoo. We use ingredients that are called amphoterics as our main active cleansing ingredients. They are non-stripping, gentle and thoroughly cleanse the hair. In the shampoos its recommended, the first item in the ingredient listing after water should be an ingredient such as lauroamphoglycinate, cocoamphocarboxyglycinate, or cocoamphopropionate, there are quite a few variations on these names but they should be similar. If you notice the label contains "ampho" in its name, this will help you to determine if this is an amphoteric based shampoo. If you have longer hair, always start the detangling process with your fingers first, then move on to a wide tooth pick or comb. Avoid pulling and straining your hair. Conditioners will not repair your hair once it is damaged. They may affect its look and feel, as well as detangle and improve the ability to comb your hair while wet . But they will not repair any structural damage present in the hair. There are no fast fixes for damaged hair. Conditioners will help add some luster to your hair. Some reconstructive treatments if formulated with the right ingredients may be able to help with breakage problems to some extent but they truly are only "bandage solutions". The only real way to deal with damaged hair is not to cause damage in the first place. If the hair is severely damaged the best thing to do, as hard as it may be for some people to come to grips with, is cut the hair down to the new growth and start again. If you want to hold on to the damaged hair, we recommed that you keep your hair hydrated with Kerasoft Revival and Quench leave in products to slick your hair down. Heating implements or styling will only continue to damage hair. When conditioners or treatments are designed for the hair the cosmetic chemist has a goal in mind. The goal could be to strengthen, add moisture, detangle, eliminate static charge, add body, add shine or combinations of all of these with a special emphasis on one. In selecting a protein to strengthen or repair hair, the formulator will have dozens of proteins to choose from, many are different in their effect on the hair, as well as the source they are derived from. Most importantly, the protein that is selected will be hydrolyzed and quaternized. When a protein is hydrolyzed it is chemically broken down into smaller sized molecules. These molecules can now easily penetrate into the hair to offer maximum reconstruction of damaged hair. When a protein is quaternized by the manufacturer, it is changed from a negative charge to a positive charge. 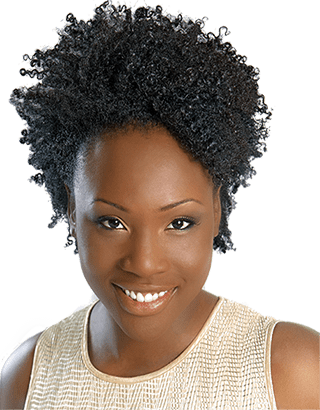 When the protein is placed on to the hair the altered protein is attracted to the hair, it wants to lock in and on to the hair to repair and strengthen it. The protein will not be easily rinsed off and go down the drain. It is extremely important the product you treat or condition your hair with has good detangling properties, especially on relaxed hair, as relaxed hair is at its weakest and most fragile state when wet. You do not want to rip and tear the hair while trying to detangle it. A reconstructor, if it has been formulated with the proper ingredients, may be able to repair external and internal damage to some extent. This depends on the amount of damage already present. Kerasoft Kerabond Filler (will fill in the weaker spots). 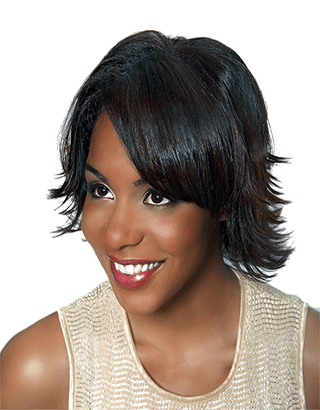 This is done every three to four months on the ends, hairline, temples or any damaged areas. The use of a leave-in-conditioner is recommended to seal and protect your hair from airborne pollutants, weather elements as well as to help prevent damage from thermal styling tools. Mineral oils clog pores and leave a build up on the hair and scalp. They should not be used on your hair or scalp as dressings. Read your product ingredients. If you see mineral oil, wax or any petrolatum product as an ingredient, make another choice. There are many other products that will do a much better job. Ask your stylist to explain the latest products and make a recommendation for your hair type. Black hair needs moisture! Moisture is water. Oil of any kind including natural ones are not water. When you are thirsty you want a glass of water, not oil. The same goes for your hair. Time and time again we have clients come to our salon and say that they are using this dressing, that lotion or that they are doing hot oil treatments to moisturize their hair . We try to explain to them that almost all traditional hair dressings encountered so far, contain mineral oils and petrolatum. These add little or no moisture to the hair. For an every day dressing they are much better off using a botanical oil product. A vast majority of our clients grew up with their mothers using petroleum jelly on their hair every day. Old habits die hard! We ask them to remind themselves every day "only water is moisture - oils are not". You need products that contain humectants - ingredients that attract and bind water to themselves. Humectants can even do this right out of the air from the natural humidity. You want products that contain such ingredients as glycerin or glycerol, NaPCA, propylene glycol, urea, chitosan, Acetamide MEA, hydrolyzed silk, panthenol, shea butter and sorbitol. These are some of the more common ingredients used in making hair care products. Our Kerasoft Moisturizing Treatment; which can be purchased in the salon contains several of these ingredients.. When you rinse the treatment off, some of these ingredients will have penetrated deep into your hair and remained there, attracting and binding moisture to themselves. Hair can be sunburned because of the sun. If you are going to be spending any time in the sun, protect your hair with a hat or by applying a sunblocking product. A thermal protection product is a must if you frequently blow dry, or curl your hair with a curling iron. They contain conditioners and polymers that form a protective barrier around your hair that can help it withstand the heat from thermal styling tools. Our products Kerasoft Interlink is used before blowdrying and Kerasoft Lelook is used before ironing. If you find you have a dry scalp, your sebaceous glands may need a little help. We recommend the use of an EFA (essential fatty acids) product such as Kerasoft Primoils. There are essential oils found in these types of products that closely resemble the natural sebum produced by our scalp's sebaceous glands. These oils will lubricate both your scalp and hair. Drink six to eight glasses of water a day when possible. Water flushes your body’s system of toxins that can cause general health, skin and scalp problems. Follow a well balanced diet. Eating lots of fresh fruits and vegetables provides the body with the natural and necessary vitamins and minerals that are the basis for growing healthy hair and skin. Products purchased in retail stores will not perform as well as professionally formulated products that are recommended for you by your stylist. It would be a lie to say that they are all not good. However, a great deal of them are formulated not only with inferior ingredients, but with ingredients that will cause product build-ups to form on your hair. These build-ups lead to many problems, such as uneven perming and colouring processes, dull lifeless hair without body and bounce. These inferior products may even stop any conditioning or reconstructing treatments from penetrating into your hair and working properly. We recommend a "Pre clean" at the salon to remove any build up, once or twice per year, followed by a protein filler "Kerabond" after a trim, to seal any open cuticles and protect finer areas around the hairline, temples and ends. The cuticle layer is the hair’s protective shield and has many tiny overlapping scales, rather like the tiles on a roof. When these scales lie flat and neatly overlap, the hair feels silky soft, looks glossy, and shines, because the flat surface reflects light back evenly. If, however, the cuticle scales have been damaged or broken, the hair will be brittle, prone to tangle easily and appear dull from the light not being reflected back evenly. The shinier the hair naturally is the more cuticle layers it has. Hair can have as little as 2 layers or as many as 15 layers. So the duller the hair the less layers it has, therefore the less protection.